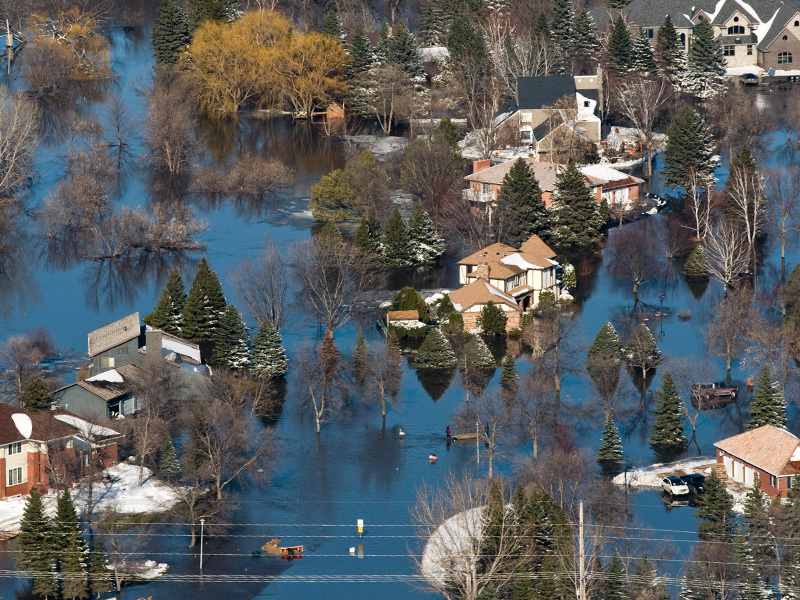 Located along the Red River of the North, the Fargo-Moorhead area is prone to flooding. In order to establish permanent flood protection, the Fargo-Moorhead Metropolitan Area Diversion Project was created. The proposed project would involve the construction of a 35-mile long diversion channel located in North Dakota that would direct floodwater around the Fargo-Moorhead metropolitan area. The project would temporarily store up to 200,000 acre-feet of flood water immediately upstream of the diversion channel inlet in order to minimize downstream impacts. The plan would remove much of the Fargo-Moorhead area from the Federal Emergency Management Agency’s regulatory floodplain. If built, the diversion would significantly reduce flood damage and flood risk, but it would not completely eliminate flood risks. Congress could take action on the project sometime in 2013. If the project is authorized, the United States Army Corps of Engineers could sign a partnership agreement with the Fargo-Moorhead Diversion Authority which would allow processes to begin for construction and the acquisition of properties. Construction could begin as soon as the spring of 2014, and is expected to take several years to complete. The Fargo-Moorhead Diversion relies on GIS to move efficiently through the planning phases of the project. As one of the first tasks of the planning phase, maps of the diversion area coded by jurisdiction were created. This enabled the team to establish contact with various agencies and organizations along the proposed routes being evaluated. GIS was utilized to model and display the current floodplain reaches as they are currently. The GIS team then modeled the predicted reaches of the flood plain that would occur as a result of the proposed project. These areas were overlaid upon land ownership parcels and aerial photographs to identify those affected by the project. These maps and associated database are available on line for the general public. Large paper posters of the maps generated from the GIS proved to be extremely helpful at public information meetings. The maps and tables generated by GIS were also used in publications regarding the project. GIS was also used to calculate costs by applying land costs to acreages identified for various needs such as easement or buy-out. 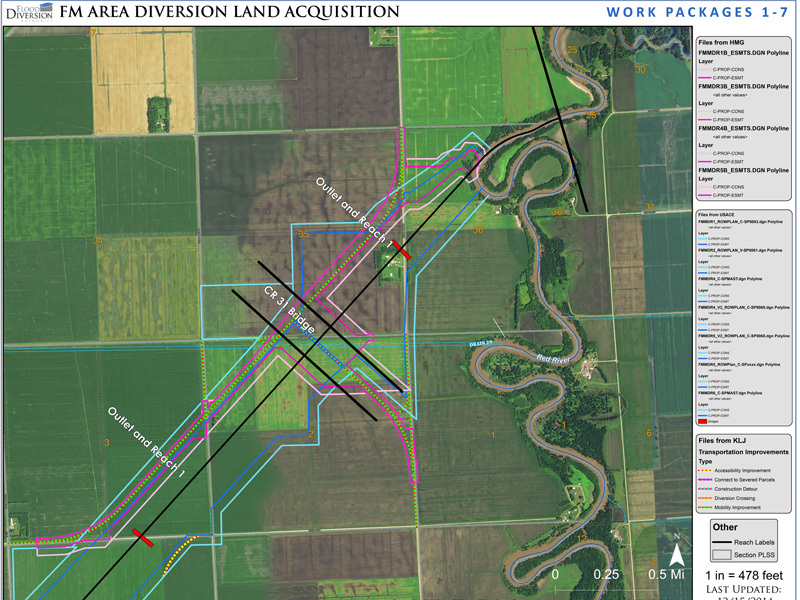 Additionally AE2S used GIS as a central storage interface for spatial information such as preliminary designs by other firms, scanned documents, soils information, and ownership contact data. GIS has proved to be invaluable thus far on this immense project. With a project of this size and scale there are mountains of paperwork and complex workflows to manage. GIS is being used along with a Workflow Manager program, WMX, to track progress of property acquisitions and store the documentation that goes along with these acquisitions and easements. WMX also automatically notifies key players in the process when certain milestones are reached, alerting individuals to prepare for the next task in the workflow. Reports are generated, and users are all kept in the loop regarding the progress of the project.